Home sales are rising across the Bay Area, even as the supply remains tight. A rebounding Bay Area economy is driving home sales higher across the Bay Area. With unemployment rates dropping across the region and tech companies promising thousands of new jobs, buyers are taking advantage of record-low mortgage rates and attractive prices to keep July home sales in the Bay Area on track to record their best year since 2005. The supply of available homes for sale remains exceptionally tight, but prices are gradually rising, offering an added incentive for sellers to rejoin the housing market. In fact, it’s becoming more common to hear of property owners willing to sell their homes at a loss in order to trade up for more affordable, higher-end homes. With increasing numbers of tech companies relocating to San Francisco, the demand for homes continued to climb in July. The inventory of available homes, however, was down 40 percent, year over year, resulting in multiple bids on virtually all properties. In all, 44 percent of homes on the market were under contract in July, more than double the rate one year earlier. Home prices posted solid gains in the month, with prices for single-family homes up 8 percent from a year ago and prices for condominiums up 20 percent. The city’s most active sales area was MLS District 9, which includes the Mission, Bernal Heights, Potrero Hill, and SoMa, followed by District 10 (Bay View, Excelsior, and Vistitacion Valley) and District 5 (Noe Valley, Castro, and Haight-Ashbury). For more details on San Francisco activity, click the chart to the right to view the complete July 2012 report. July was another strong month in our East Bay neighborhoods, with 69 percent of homes garnering multiple bids. Buyers outnumbered sellers in July, as it has for much of 2012, with 44 percent of homes in contract (up from 42 percent in June). Lower-priced homes were most in demand, with 70 percent of homes on the market priced below $750,000 — and 76 percent of homes in contract. The East Bay remained a popular destination for homebuyers priced out of the San Francisco market. Investors were also active, offering all-cash deals to convert lower-priced owner-occupied homes into rentals. For more details on East Bay activity, click the chart to the right to view the complete July 2012 report. Like other Bay Area communities, Contra Costa County saw fewer listings and more closings in July. In the Alamo-Blackhawk-Danville area, listings were down 50 percent and closings were up 27 percent. In Lamorinda (Lafayette, Moraga, Orinda), listings were down 38 percent and closings were up 20 percent. Fully two-thirds of all homes on the market and priced below $500,000 were in contract; similarly, 55 percent of homes priced between $500,000 and $1 million were in contract. The median price of homes sold in July rose 9.5 percent in July to $684,250. For more details on Contra Costa County activity, click the chart to the right to view the complete July 2012 report. The most active price point in Marin County real estate in July was $500,000 to $750,000, with 231 homes for sale and 49 percent of them in contract. Homes priced from $100,000 to $500,000 totaled 132, but the percentage in contract was a remarkable 73 percent. In all, 532 homes were priced at $1 million or less; 246 were priced from $1 million to $2 million; 81 priced from $2 million to $3 million; 25 priced from $3 million to $4 million; and 70 priced above $4 million. July’s median sale price in Marin County rose nearly 9 percent, year over year, to $842,500 — the highest in the Bay Area. For more details on Marin County activity, click the chart to the right to view the complete July 2012 report. Sonoma County single-family home sales jumped 21 percent in July, year over year, while the supply of homes on the market dropped 52 percent. Condominium sales rose 15 percent, while the supply fell 75 percent. The median sale price countywide rose 7 percent, year over year, although in the Sonoma Valley region (Sonoma, Glen Ellen, and Kenwood) it rose 13 percent. Nearly 90 percent of homes on the market were priced at $1 million or less, with more than two-thirds of the supply in contract in Kenwood (69 percent), Santa Rosa (71 percent), Petaluma (73 percent), and Rohnert Park (78 percent). Among homes priced over $1 million, 28 percent were in contract in Sonoma, 27 percent in Petaluma, 19 percent in Santa Rosa, and 18 percent in Glen Ellen. For more details on Sonoma County activity, click the chart to the right to view the complete July 2012 report. With the supply of homes for sale unable to meet demand, the percent of Napa Valley homes in contract has been rising steadily for four months, reaching 45 percent in July — the highest level in more than three years. As a result, multiple bids on homes has become commonplace. Another result: Home prices rose significantly across Napa County, with the median sale price jumping 24 percent in one year, to $405,000. Virtually all homes priced at $500,000 or below were in contract — and half of those between $500,000 and $750,000. Above that level, the percentage of homes in contract fell sharply in July, ranging from 5 to 22 percent. 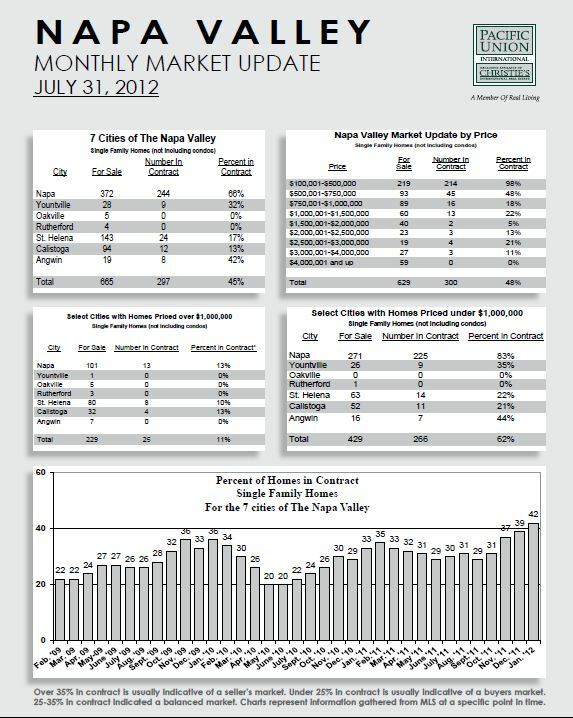 For more details on Napa Valley activity, click the chart to the right to view the complete July 2012 report.